Earth is a dynamic body, tectonically active, with gigantic forces pushing and pulling the plates around, piling up mountain ranges and opening ocean basins. What has not been recognized for a very long time is that as those tectonic forces stress the rocks deep in the earth they turn into batteries from which electric currents can flow out and charge the earth’s crust. It has become increasingly clear that this process – rocks turning into batteries – is crucial to our understanding of the complex signals the earth sends out before major earthquakes. “Rock batteries” are different, however, from the common electrochemical batteries that come in many shapes and sizes and which are used in everyday life. When rocks are stressed, something very unique happens that has no equivalent process in electrochemical batteries: In rocks, electrons and what are called “holes” become activated under pressure, similar to charges that occur in transistors – a process that is well understood in semiconductor physics. Most everybody knows what electrons are: the negatively charged elemental particles that carry currents through copper and other metal wires. Electrons can flow through the wires and be pulled out to form electron beams that will travel through a vacuum, as they did in the cathode ray tubes used in TVs before flat screens were developed. Holes are different. They are what physicists call pseudo-particles and they exist only in solids. They are places in a solid such as a rock where an electron is missing in the atomic structure. Hence, holes are defect places where electrons should be. They create a positive charge relative to their surroundings. Most minerals in rocks contain atomic defects in their otherwise orderly crystallographic structures. In these structures, pairs of oxygen anions (negatively charged ions that migrate to positive charges) exist that have changed their energy levels from the usual two electrons to the unusual one electron – from O2– to O–. Most of the time these O– pairs are tied together closely in the form of peroxy defects, innocuous and electrically inactive. However, when rocks are stressed, some of these peroxy defects break up. They produce an electron that becomes trapped in the holes left by the broken peroxy bonds, resulting in a highly mobile positive charge carrier, capable of letting currents flow out of the stressed-rock volume. These currents can travel fast and far. Because of their unusual properties, these holes, which are associated with minerals containing O– in a matrix of O2–, have been given a special name: positive holes, sometimes abbreviated as p-holes. When rocks are stressed deep in the earth’s crust, p-holes are generated, leading to active current flows. The p-holes flow out of the stressed-rock volume at an initial speed of about 100 meters per second, spreading into the surrounding less-stressed or unstressed rocks and traveling distances on the order of kilometers, even tens of kilometers. When they arrive at the earth’s surface, they can cause a number of effects. For instance, when they flow into water, they can strip electrons off water molecules forming hydrogen peroxide, which can affect dissolved organics through partial oxidation. When they O– accumulate at the solid earth’s surface, they set up potential differences between the earth’s surface and the subsurface. Trees can sense the electric potentials through their root systems, which is why I am collaborating with the HeartMath Institute Research Center to measure changes in tree and ground potentials. When the p-holes accumulating at the surface increase, they start to recombine, returning to the peroxy state. In the process, they emit infrared photons that satellites can pick up as thermal infrared (TIR), which can make it appear as if the earth’s surface is heating up while in reality the effect is the result of a non-thermal infrared emission caused by the recombination of O– pairs to form peroxy bonds. At the same time, large electric fields are building up at the earth’s surface that are strong enough to ionize the air at the ground-to-air interface, injecting massive amounts of positive ions into the lower atmosphere. These air-ionization events often occur in pulses, sending pressure waves upward through the atmosphere that can propagate all the way up to the ionosphere, causing what are called acoustic gravity waves (AGW) at frequencies too low for humans to hear. Additionally at the same time, what is basically an air bubble laden with positive ions also expands upward, through the troposphere to the edge of the stratosphere. From there, the positive ions continue to rise, drifting farther, through the mesosphere. In response, electrons in the ionosphere are pulled down, causing perturbations in the ionospheric electric field, described as “turbulences,” and changes in the total electron content, known as TEC anomalies. TEC anomalies are being evaluated around the clock and around the globe as part of the heightened interest in space weather and in pre-earthquake science. With everything seeming so clear-cut and basically well understood, the question arises: Why isn’t the pre-earthquake rock-battery science a well-established discipline by now? The answer is: Even though the rock-battery concept seems conceptually simple and intuitively easy to understand, it is enormously complex. 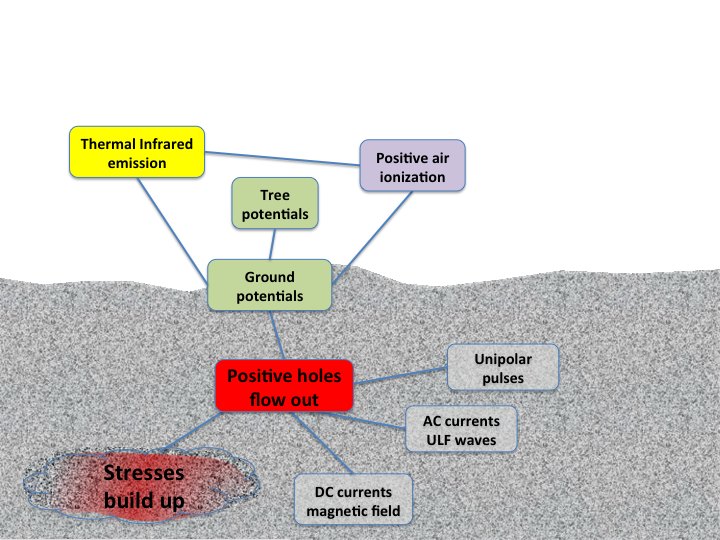 The complexity lies in understanding how the electric circuit is completed or closed in the process of achieving the sustained current outflow – enabled because of p-holes – from any stressed rock deep in the earth’s crust. For the rock battery to work, the outflow of a certain number of positive-charge carriers that leave the stressed rocks deep in the earth has to be balanced by an outflow of an equal or nearly equal number of negative charges. Well, that’s the essence of any battery. In an electrochemical battery, for instance, metal ions flow through the body of the battery, from the anode (positive) to the cathode (negative), while the same number of electrons that flow through the outer circuit via electric wire also flow from the anode to the cathode. When rocks are stressed, defects that exist in an inactive state in their constituent minerals become activated. They turn into electron-hole pairs, of which the holes, called “positive holes”, have the remarkable ability to flow out of the stressed rock volume. They can travel fast (up to 100 m/s) and far (easily tens of kilometers). On the way and upon arrival at the Earth’s surface, they cause a multitude of reactions, which produce some form of signals that we can detect. Changes in the ground potential and surface/subsurface electric fields among them, but also changes in the spring water, well water, ground water chemistry. Interestingly, trees seem to be excellent antennae to sense the electric field between their roots and their trunks or branches. In nature, deep in the earth’s crust, p-holes have no problems flowing out of any stressed rock, spreading into the surrounding less-stressed or unstressed rocks. However, for reasons that are rather well understood, though a bit too complicated to explain here, electrons cannot follow suit. They may be highly mobile within stressed rocks, but outside, in unstressed rocks, their mobility is severely restricted. Hence, the rock-battery circuit may not close at all, may partially close or may require special conditions for the circuit to close. Indeed, much of the controversy that has raged for decades over the question of whether pre-earthquake signals exist probably stems from the fact that as long as there was no rock-battery concept, the discussions over pre-earthquake signals suffered from lack of an objective scientific basis. Related to Tree Experiment in Featured Research.